New death in usual place of residence data for 2016 has been added to the end of life care profiles for local authorities, Clinical Commissioning Groups (CCGs), Sustainability and Transformation Plan areas (STPs), Strategic Clinical Network areas (SCNs) and Government Office regions (GORs). The vast majority of people would prefer to be cared for and die in their usual place of residence towards the end of life. Death in the usual place of residence is presented as a proxy indicator for choice and access to services towards the end of life. These indicators describe the proportion of deaths that occur at home or in a care home; they exclude deaths from external causes. In 2016, 45.8% of people died in their usual place of residence (figure 1), the percentage of deaths rising with increasing age at death. Just over one third of deaths (35.8%) occurred in the usual place of residence for persons aged under 65, compared to more than half of deaths (53.9%) in persons aged 85 and over. 44.5% of deaths from cancer, 44.8% of deaths from circulatory disease and 32.2% of deaths from respiratory disease occurred in the usual place of residence during 2016. The recent trend in England of the percentage of deaths in usual place of residence was increasing, rising from 35% in 2004 to 45.2% in 2016 (figure 2). Recent trends for England within each age group and by cause of death are summarised in Table 1. There were increases in the all age percentage and in all the age groups studied (0 to 64, 65 to 74, 75 to 84 and 85 and over). 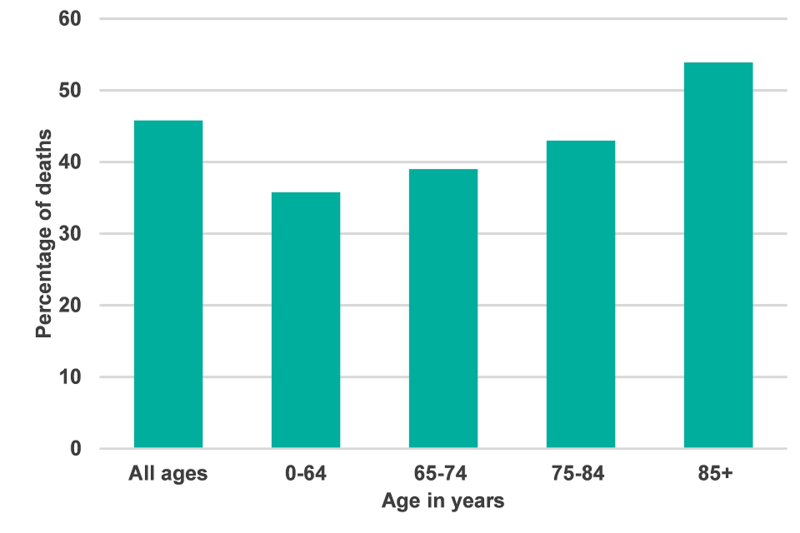 The largest percentage age group increases (10.2% and 9.1%) were associated with the age groups 75 to 84 years and 65 to 74 years respectively. 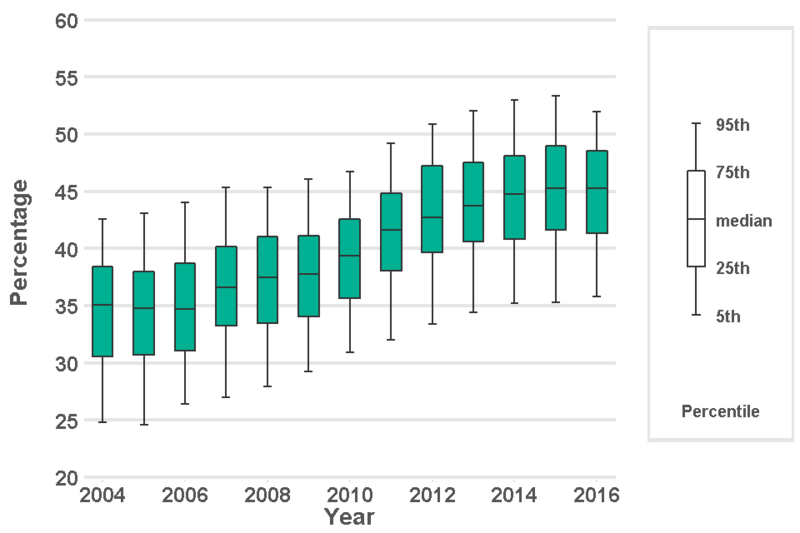 The recent trend in deaths in usual place of residence was increasing for cancer and circulatory disease similar to the all causes of death measure shown in figure 2. 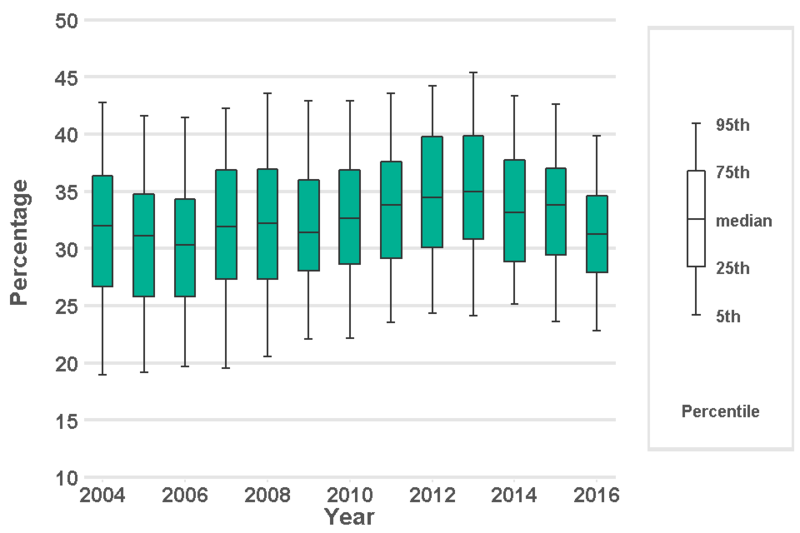 For respiratory disease the trend was decreasing (figure 3). In 2016, the percentage of deaths in CCGs (all ages and all causes of death) in the usual place of residence ranged from 27.3% to 57.4%. 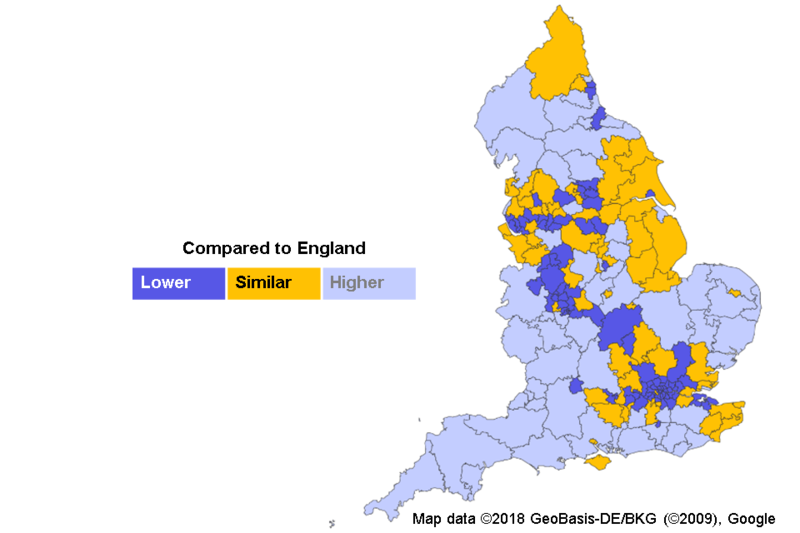 Map 1 shows that the percentage of deaths in the usual place of residence are generally lower in highly urbanised CCGs with the lowest values generally associated with London, Birmingham and parts of the north-west. Values are higher in the south, south-west, East Anglia and parts of the north. There is also considerable variation across the country by district and local authority, the percentage of deaths in the usual place of residence ranging from 27.3% to 61.4%. The highest values associated with district and local authorities were mainly associated with rural areas and the lowest with urban areas and in particular the London area. For both CCGs and district and unitary authority areas the percentage of deaths in the usual place of residence was lowest in the three most deprived deprivation deciles and highest in the three least deprived deprivation deciles. View the End of Life Care Profiles for more inequalities information. The End of Life Care Profiles aim to improve the availability and accessibility of information around end of life care. The profiles provide a snapshot overview for various geographies in England. They are intended to help local government and health services improve care at the end of life. The website contains data for upper tier local authorities, former Government Office regions, England together with lower tier local authorities and Clinical Commissioning Groups. Providing care at the end of life often involves the interaction of many different care agencies. The profiles will help commissioners and providers to get a clearer picture of the end of life care needs of their local populations. These will help with the planning and delivery of services and will support local drives towards improving end of life care. The data has been extracted using the Office for National Statistics (ONS) annual mortality and population statistics. Further details about the profile methodology are available within the definitions section of the online version of the profile.